Completed in August 2015, the £2million Rocking Horse Nursery on the University of Aberdeen campus is not only the first passive-certified nursery in Scotland, but also the first building of its kind in the Scottish commercial sector. The significance of the nursery development was recognised by Professor Wolfgang Feist, director of the Passive House Institute, who visited the nursery in May 2016 to present its passive house certificate. “Professor Feist doesn’t make too many visits to the UK so this was a real coup for the University of Aberdeen and Scotland,” says BMJ Architects project architect Siobhan Davitt, who now works for ADP: Architecture. “In his keynote address, he was very complimentary about the building.” The location of the passive nursery building at the University of Aberdeen is significant. If the passive concept is to move from niche to mainstream in the UK, universities will certainly play a role in educating and inspiring the public. Further acclaim in the academic world came in November 2016 when the nursery won the large institution award in the built environment category of the Green Gown Awards, which recognise exceptional sustainability initiatives by British universities. 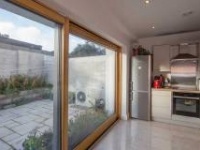 However, at the outset of the project in 2014, the university board was sceptical about the passive house standard. It had wanted BMJ Architects to take an innovative approach, and was open to the idea of a modern, sustainable structure replacing the old Hogwarts-style building, with its leaky windows and propensity to flood. But few of the members of the board knew anything about the passive house standard. Their enthusiasm was further dampened when the design team consulted passive house experts and were told it would inflate costs by 15 to 20%. Faced with so much that was unknown and unpredictable, the team faced many challenges along the way and worked closely with passive house consultants Future Komfort to resolve them. 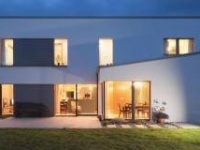 Steff Bell, chief consultant, working in conjunction with German passive house experts Herz & Lang, helped the team with PHPP calculations, reducing cold bridging, and improving airtightness. The team also had to find a way to insulate the underside of the floor slab, and it proved tricky to dress the insulation around the complicated ground beams and pile caps. “We looked at refining those details as early as possible to make the design as simple and buildable as possible. But it added an additional level of complexity to an already fairly complex building,” she says. The phasing of the building threw up more conundrums during the 13 month build. The contractor’s team ended up doing all the ground works in the winter, but there was a lot of rainfall, and the timber kits needed to dry out before the team could put up the airtightness layer. “Phasing was key. We tried to make up time by installing the screed, but the airtightness membrane had to adhere to the slab before the screed went on, which was challenging for the contractor,” Davitt says. (clockwise from top left) Insulation detail at the concrete pile foundations; spiral MVHR ducting and Intello vapour control membrane visible here at ceiling level; 65mm self-levelling fl oor screed, the timber structure exposed to the inside of the nursery; Sarnafi l single ply roof membrane; larch timber cladding, Internorm aluclad windows and insulated reveals; Trad Safey Decking used to enable work on the double height ceiling; a series of Fakro quadruple-glazed roof windows, with U-value of 0.58, bring sunlight into the glulam-framed nursery space. In addition, the shape of the structure itself placed limits on the design process. When he came to visit, Professor Feist commented that he was especially impressed by the building’s performance because it is harder for single-storey structures to achieve passive house certification. 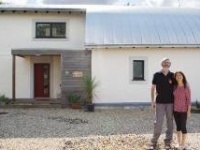 Sourcing parts proved difficult because of unfamiliarity with passive house in Scotland. Many of the components had to be shipped in from Poland or Austria. “Getting them delivered and sorting out warranties was complex,” Davitt says. Local timber frame manufacturer Scotframe prefabricated the closed panel, Val-U-Therm timber frame system used for the build. The wall and roof panels were in stud sizes of 235mm and 300mm respectively, helping these elements to achieve extremely low final U-values of 0.087 and 0.074 – the project’s northerly latitude meant tighter specs were required to achieve the passive house standard – after further insulation was added. The timber frame structure was erected on site by Hybrid Build Solutions, and was integral to the project beating the passive house airtightness standard with a result of 0.48 air changes per hour. The finished building is divided into two main areas around an enclosed, protected outdoor play-space. Part of the building is clad with larch, and part with a colour-changing cladding panel that shifts between green and orange. Sparkling particles in the materials react to light conditions. The university has installed sensors to monitor the energy performance, and Calum Proctor says the energy savings have shown a huge drop. “Much of the energy comes from having the kids running around in an airtight building as they generate 4-5kW of power, he says. There’s also an air source heat pump supplying underfloor heating, and a solar thermal system that contributes to domestic hot water. Though the nursery is performing extremely well, there have been a few minor teething problems, and some overheating in the summer months, particularly in the kitchen. Proctor says: “It’s not easy when the air outside is 23C and inside it’s 22C. There’s always the possibility that it will overheat by 10% a year [the maximum allowed with passive house certification], but we are working within those parameters. When it happens, there can be a slight discomfort, but nothing too great — and everyone involved loves the nursery,” he says. Heating: Two Mitsubishi Electric Ecodan 14kW air source heat pumps supplying underfloor heating and DHW tank. 6.93kW AES Serpentine solar thermal array supplying 500 litre DHW tank. Ventilation: Menerga Adconair 760501 MVHR unit. 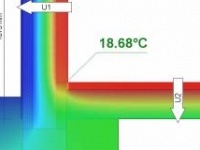 Passive House Institute certified heat recovery efficiency of 89%.